My first job out of college was helping to advise SaaS companies on fundraises and M&A opportunities. I learned quickly that for every successful outcome in SaaS, there are 10+ broken processes – and many reasons for an acquirer or investor to pass on a deal. Founders and their current investors must control what is controllable – and that’s something I spend a lot of time on with founders now as a VC on the other side of the table. Thorough preparation ahead of a diligence process – or lack thereof – is a harbinger of success or failure. That preparation includes multiple dry runs of the presentation and a thoughtfully prepared set of diligence materials. One of the key factors for a successful fundraising process is to keep every investor at roughly the same stage of diligence throughout the process. 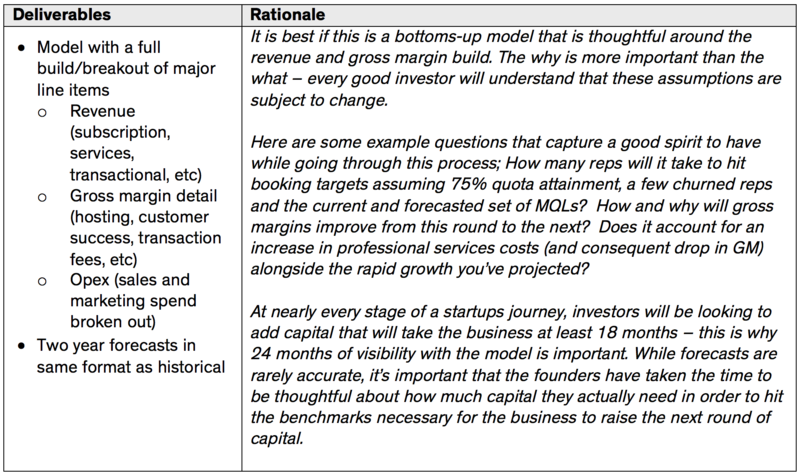 As a founder, you don’t want one group getting to a term sheet far ahead of others, because you want to optimize around choice, and you certainly don’t want investors passing because they didn’t have time, or information that was key to a decision. Companies at all stages have been increasingly entering fundraises without completing the standard diligence materials. Since we’re deep into banana-land-fund-everything-that-mentions-AI/ML/Crypto, there are many cases where companies are still getting good term sheets without much diligence preparation at all. These are the exceptions. And I still argue that even those companies would benefit from a thoughtfully prepared set of diligence materials because they would have better optimization around price or partner. So, what does a complete set of diligence materials for a SaaS company look like? 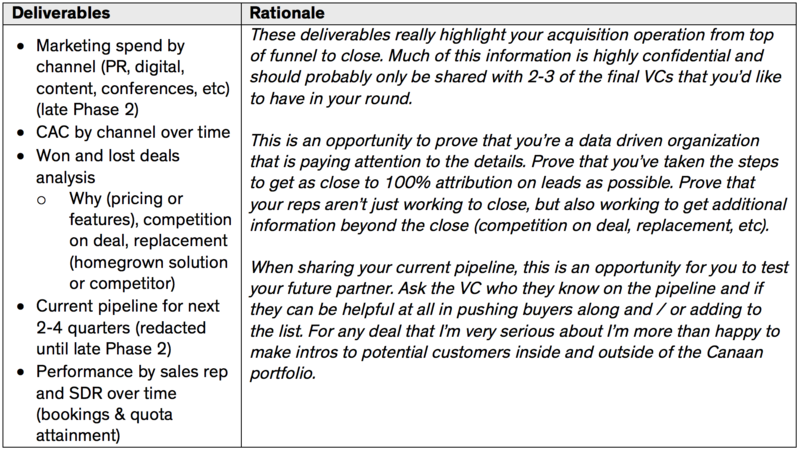 The breakdown below is my cheat sheet for SaaS companies going through this process. I’ve attempted to break out a comprehensive set of materials here with Phase 1 (immediately after 1st meeting) and Phase 2 (after 2nd meeting and genuine interest is established). This is by no means exhaustive and there are many unique businesses that need specific materials. This list has been developed through the lens of an early stage investor, which is our focus at Canaan – though much of this is irrelevant for seed stage companies without much traction. The more a company thinks through and prepares these materials ahead of a process, the better they will know their own business, tell its story and maximize options. This list is by no means a fully comprehensive set of diligence requests for a process, but it’s a great baseline with which to enter a fundraise. I have intentionally excluded some of the more standard items such as; competitive landscape, current and future integrations, TAM analysis, etc. The best SaaS businesses will have all of this readily available because they’re using it to guide their business. Plan ahead, and ask your team to be thinking about interesting deliverables or metrics that you can use with investors to uniquely illustrate how strong your business is. Capital is abundant in the market today, but every single startup, regardless of strength and certainty to close rounds, can drive to a better outcome by entering their process armed with thoughtful diligence materials. That, or just drop crypto and AI a few times during the pitch and circumvent this nonsense completely.